a classification of the various types of malocclusion. The classification is based on where the buccal groove of the mandibular first molar contacts the mesiobuccal cusp of the maxillary first molar: on the cusp (Class I, neutroclusion, or normal occlusion); distal to the cusp by at least the width of a premolar (Class II, distocclusion); or mesial to the cusp (Class III, mesiocclusion). Each class contains two or more types or divisions. See also classification of malocclusion. n.pr a classification of the different forms of malocclusion. See also malocclusion. n the normal anteroposterior relationship of the mandible to the maxillae. The mesiobuccal cusp of the permanent maxillary first molar occludes in the buccal groove of the permanent mandibular first molar. 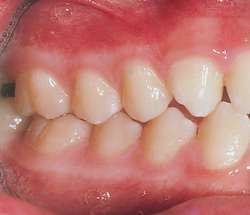 n.pr with narrow arches; labioversion of the maxillary anterior teeth and linguoversion of the mandibular anterior teeth. n.pr with linguoversion of the maxillary anterior teeth; crowded; lack of development in the proximal region. n.pr the posterior relationship of the mandible to the maxillae. The mesiobuccal cusp of the permanent maxillary first molar occludes mesial to the buccal groove of the permanent mandibular first molar. n.pr with labioversion of the maxillary teeth. n.pr signifies a unilateral condition. n.pr with linguoversion of the maxillary central incisor teeth. n.pr the anterior relationship of the mandible to the maxillae, may have a subdivision. The mesiobuccal cusp of the permanent maxillary first molar occludes distal to the buccal groove of the permanent mandibular first molar. n.pr with good alignment generally but arch relationship abnormal. 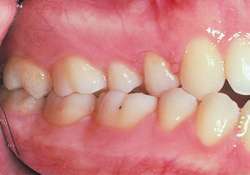 n.pr with good alignment of the maxillary anterior teeth but linguoversion of the mandibular anterior teeth. n.pr an underdeveloped maxillary arch; linguoversion of maxillary anterior teeth; good mandibular alignment. In the 25-year history of the Division 1 Kodak All-America program, there have only been four four-time winners.